Tinytag temperature/relative humidity data loggers monitor the conditions affecting strawberry plant development in glasshouses. Monitoring temperature and humidity with Tinytags is providing valuable data to help optimise growing conditions for strawberry plants in glasshouses through all growth stages. Recording environmental conditions every hour helps ensure optimum plant development and subsequent fruit yield. 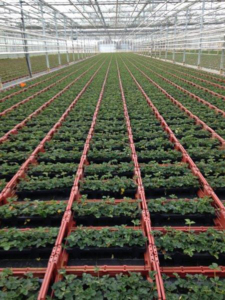 Plant-tech Innovations Ltd is an experienced soft fruit propagation company using state of the art glasshouse and nursery facilities in the UK to deliver bespoke high quality strawberry plants. Sarah Corbin, Plant-tech's Business Development Manager is responsible for data collection, interpretation and management. Analysis of results enables the company to optimise the growth of strawberry plants to ensure the plants deliver the maximum fruit yield possible at the time it is required by Plant-tech's customers, the fruit growers; and subsequently great quality fruit for the growers' customers, the consumers. Five Tinytag View 2 data loggers located within the plant tray inside or outside the glass, monitor temperature and humidity every hour. The data obtained from the loggers allows the company to easily track and analyse the environmental variables the plants are exposed to. Strawberry plants use certain environmental trigger points to respond to nature's seasons. Temperature and humidity, along with other weather data points is monitored in order to track these variables which affect the plants development and performance. In turn, this allows Plant-tech to make informed decisions surrounding the utilisation of the glasshouse environmental controls and if necessary move plants around the 25 acre site to optimise the plants' response and readiness. This insight is imperative to ensure that quality plants are delivered to their customers. Sarah comments, "I had used Tinytags previously, and they were also recommended to us by an agronomist. I have found them to be flexible, robust and easy to use. It is very quick and easy to download the data which can then be saved in standard formats to be utilised in other templates, to provide the answers we need to allow informed management of our plants." The orange flag on the left of the photograph indicates the location of one of the Tinytags placed among the plants in the trays.